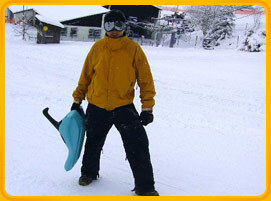 The Zipflracer is produced using a unique blowmoulding process and is made out of durable, ultra-conductive polyethylene, ideal for all snow conditions. Due to its ergonomical design, users can regulate speed through the power of their legs and steer using the piston- like (‘Zipfl’ in German) control stick. The Zipflracer is 66 centimetres long, weighs around 3,000 grams and can reach a maximum speed of at least 100 km/h. The current speed record is 157,34 km/h!